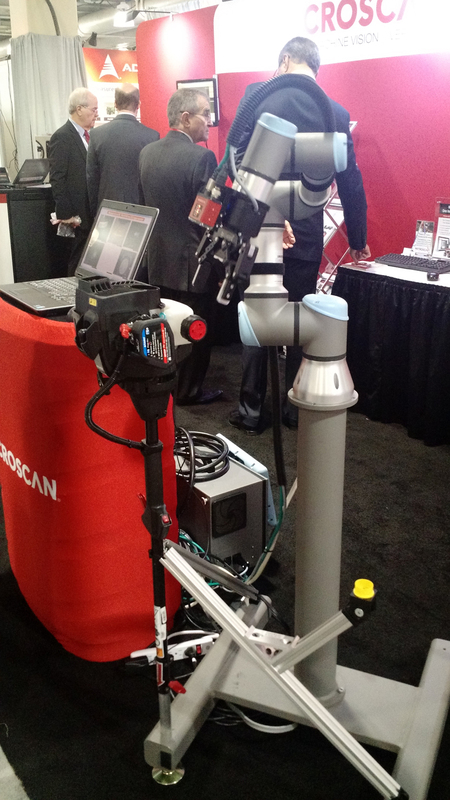 Microscan along with distribution partner Axis New England, demonstrated flexible in-line inspection using the Universal Robots collaborative UR3 robotic arm and Microscan’s latest machine vision smart camera platform at The Vision Show 2016 at the John B. Hynes Convention Center in Boston, MA, from May 3-5. Microscan, a global technology leader in barcode, machine vision, verification, and lighting solutions, in collaboration with its distribution partner Axis New England, demonstrated flexible in-line inspection using the Universal Robots collaborative UR3 robotic arm and Microscan’s latest machine vision smart camera platform, previewed for the first time at The Vision Show 2016 at the John B. Hynes Convention Center in Boston, Massachusetts, from May 3-5. The demo featured the world’s smallest Ethernet smart camera, slated for release from Microscan this summer 2016, inspecting a small engine for the presence of critical components. The UR3 robot demo was setup to read a Data Matrix 2D code and inspect the presence and position of several components on a small engine, such as a choke lever and a fuel cap, to demonstrate how a single, flexible camera-based system can comprehensively address applications from barcode reading to complex inspection. In this simple demo, if the Data Matrix code was missing or obstructed the robot would receive a failed result from the smart camera and use this data to trigger an action to “shake its head” and try to read the code again. If the choke lever was released, the robot would receive a failed result based on the lever angle and would then use the robotic arm to reset the switch into position. Similarly, if the fuel cap was missing, the robot would use its gripper to pick up the cap from a programmed location and then place and secure it back onto the fuel tank. Microscan’s latest machine vision smart camera platform was chosen for this demo due to its compact size and flexibility to meet the widest range of needs in terms of on-board image acquisition, vision processing and communications options. Not only are these cameras capable of high-performance barcode reading and complex vision inspection, enabling automatic identification, quality assurance and guidance applications, but they are also offer unrivaled advantages for speed, size, and precision necessary for vision-enabled robotics applications. Microscan’s new imaging devices are the world’s smallest smart cameras and are up to twice as fast as competitive cameras in terms of vision processing performance. In addition, these cameras feature integrated liquid lens autofocus technology for optical working distance adaptability without any manual adjustment. Learn more about the benefits of machine vision at http://www.microscan.com/vision. To be the first to know when Microscan’s latest camera platform arrives, sign up at http://www.microscan.com.